CI Structures Ltd. is the Manufacturers Representative for Sprung Instant Structures Ltd (North America) operating throughout Europe, the Middle East and Africa. 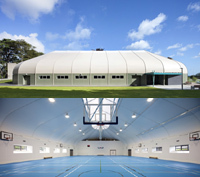 The company was established in 2002 and is a leading supplier of high performance, affordable, building solutions to schools, clubs and industry. Each structure is individually engineered to meet our customer's building requirements and with over 200,000 sq metres of inventory in stock at any one time, we, through Sprung Structures Inc., are equipped to rapidly respond to their requirements on a global basis. Sprung Instant Structures Ltd is a North American company that has been in business since 1887. The company manufactures the most technologically advanced and affordable prefabricated framed membrane structures available on the market.